NewsNewsOUR TAKE: Summertime means ice cream to us! OUR TAKE: Summertime means ice cream to us! 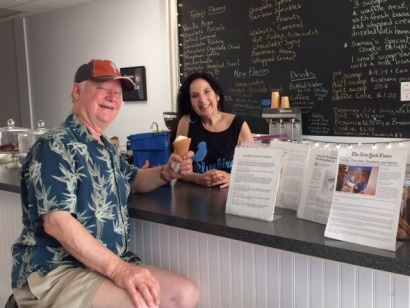 Bluebird Homemade Ice Cream in Cross River is THE PLACE for ice cream. Perusing the menu of 20 to 25 rotating flavors, including Salted Caramel, Chocolate Chocolate Chunk, Triple Berry and Stumptown Coffee – creates delicious decisions. 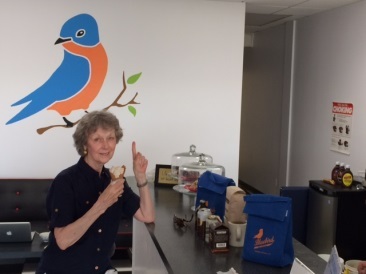 Bluebird Ice Cream is the dream of Barbara Kessler, John Jay High School Spanish Teacher. The venture was inspired by her son, Josh Kessler Reynolds, a Seattle ice cream entrepreneur. On a recent visit, I reluctantly tried the Stumptown Coffee Ice Cream flavor. I am a coffee lover, but not a coffee ice cream lover. I am now a convert to Bluebird Stumptown Coffee. Enjoying the ice cream in the home made cone is pure joy. Take home a pint; add some amaretto and prepare for a complete taste explosion! Cross River is a lovely drive from wherever you are. 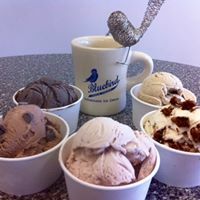 Add Bluebird Ice Cream to your 2017 Experience List. All natural gourmet homemade ice cream (made on premises). Also serving lactose-free (vegan) flavors, gluten-free, and no sugar added flavors.